Many of you will have heard various reflections from this year’s New Wine. 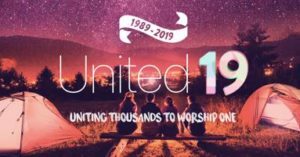 Perhaps you have heard us talking about it and are interested in coming along to United 19 next year. Emma Norrington has put together a short video of highlights from United 18 which gives a taster of our week away. New Wine United is moving next year from Shepton Mallet to the East of England Showground in Peterborough. As United, the wider Church family gathers in the summer to celebrate everything God has done in our lives, and to encounter Him afresh together and take His blessing back to our churches and communities – to see the nation changed through the local Church. United is a space for people to spend quality time together, sharing, receiving and experiencing & being challenged by God. Enjoy great teaching, worship and a full and varied programme. Some of us from Christ Church have already booked for 2019. We will be going to week 2: Sunday 4th August – Saturday 10th August 2019. There is the opportunity to camp in tents or caravans or stay locally off-site – the choice is yours. A typical day at United looks something like this, although you can go to as little or as much as you wish. Prices include entry to all venues, use of facilities and a camping pitch (no discount for staying off-site). A full children’s / youth programme is included. Day and half week tickets are also available. For more information and to book a place at New Wine United 19, please go to https://united.new-wine.org/week-2 . When booking you will be asked for a camping Church – please choose “Christ Church with St. Mary at the Walls Colchester”. Alternatively speak to any of us who went this year – Paul, Katherine, Beth, Tim, Naomi, Paul, Glyn, Emma and Sheila – for more details.